No one likes to hear that they need a root canal, but root canals are often necessary if your tooth sustained damage or is infected. At Kingsway Dental Centre, we can provide a pain-free, gentle root canal in order to restore your dental health and comfort. Root canals are often our last chance to save your existing tooth. Saving your natural tooth is important because once tooth loss occurs, it can create a negative chain reaction with your oral health. A missing tooth can cause problems with your bite (malocclusion) and potential bone loss because the teeth and jawbone have a dependant relationship. When you have a missing tooth, your remaining teeth may shift because of the gap in your smile. In order to determine the need for a root canal, one of our dentists will perform an evaluation and take an x-ray. If you need a root canal, you may find that the treatment relieves much of your discomfort and provides relief. We will make sure you are completely numb for your procedure. Your comfort and well being are our number one priority. Root canal therapy starts by making a small hole in your tooth in order to gain access to your tooth’s canal. Your dentist will then completely clean out the infection and place some medication to help with the healing of your tooth. Once your root canal is complete, he will fill the canal with an inert material and close your tooth back up. You should start feeling better within a few days. Your dentist can give you advice regarding managing your discomfort, if necessary. Gradually, as your body’s natural healing ability takes over and the infection clears up, you will feel normal again. If discomfort persists for more than a few days, please let us know. 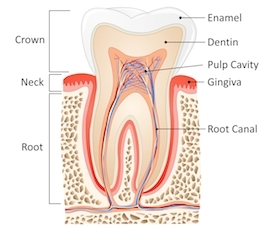 After your root canal therapy, you may need a dental crown in order to protect your tooth. After a root canal, your tooth will be brittle and more fragile. A crown protects your tooth by placing a protective cover over the top that absorbs some of the force of chewing. If you suspect you need a root canal, the best way to find out is to come in for an exam with Dr. Haymour, Dr. Everett Postill, or Dr. George Laschuck. Once we perform a thorough exam, we can let you know the options available that will successfully support your dental health. Our Kingsway Dental Centre team is gentle and welcoming. We treat patients with care and respect. We look forward to meeting you and exceeding your expectations.